I've spent a lot of time in tool sheds and garages. My father taught me how to build shelves when I was seven, and since then carpentry and mechanics have been my passion. And if there's one thing I've learned, it's that the best rolling tool chest makes work much easier. What Is The Climate In Your Workshop? One might think that a tool chest is an odd line to draw in the sand. I know it doesn't seem important at first, but consider this. Do you work in only one area? How often can you bring your work to your shop? I don't know about you, but I work all over the house. I like having a lot of options with my tools, so I don't want to carry a twenty pound chest everywhere. Rather than trying to figure out what tools I need so I don't have to carry the whole chest, I just bring the chest with me! All those cabinets, hooks, and drawers may be tempting but you should take a step back. A tool chest that seems like a great deal could be a terrible choice. In point of fact, sometimes getting a chest with fewer features is better. If you take a look at the low-cost luxury tool chests, the ones with all the bells and whistles, you'll notice that they're cheaply made. They have to be in order to get so many features in for such a low price. 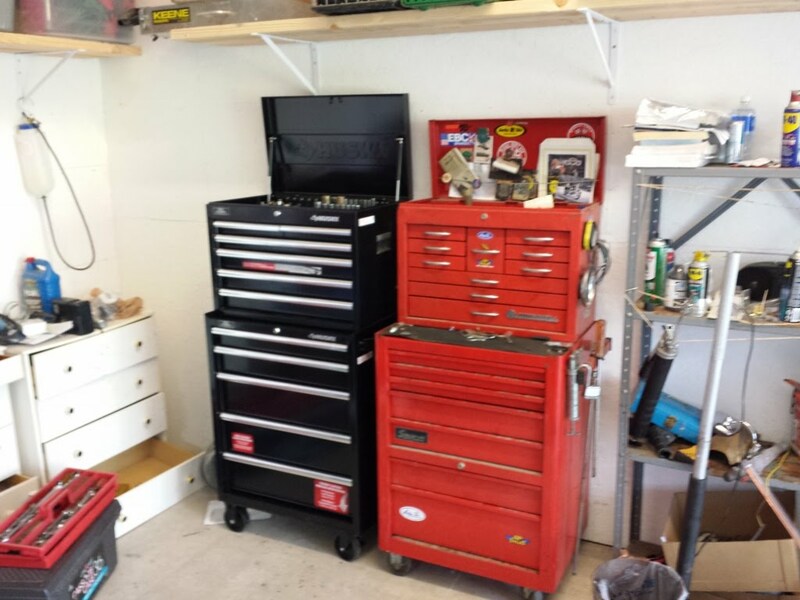 The last thing you need is to replace a tool chest every other month. If you get a chest with fewer features, you may be able to get a higher quality product. They don't have to spend as much on manufacturing costs so they have a higher likelihood of using high quality materials. So keep your budget in mind when considering a new tool chest. Restraint is a virtue. Where do you live? What's the weather like? What kind of things do you work on in your shop? Is it especially hot or humid? These are things that you need to consider when looking at tool chests. Why? Because you'll want to take care of your purchase. Damp climates cause metal to rust, which means your fancy metal tool chest could be in danger. If you do any kind of metal work you're likely to melt a plastic tool chest. And given how much weight these things have to hold up they don't need to be fully destroyed before they break down. That said, a plastic or metal rolling tool chest may legitimately be the best choice even in difficult climates. If you're often working on your own and have physical difficulties, you may want a lightweight chest. In that case a plastic chest would be the best choice. Metal tool chests can generally hold a lot more weight, but they're heavier. Most metal chests are little more than rolling dressers, though some do have shelves for wrenches and drill bits. Plastic chests will usually have peg boards with molded grips for your tools. It's also important to inspect the quality of any extra feature. Having more drawers sounds helpful until you find out how easily those drawers slide off-track. Peg boards with molded plastic grips are useless when they aren't tight enough to actually grip anything. While you should decide on what features you really need when planning your budget, here you should inspect those features and see which chest offers the best quality for the cost. 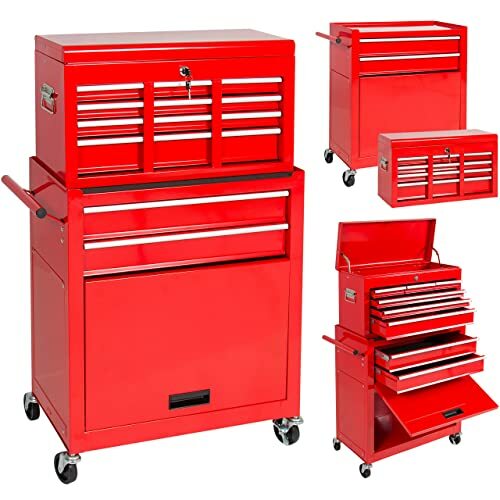 Unless you're independently wealthy, it's unlikely you have time to inspect each and every tool chest with rolling wheels out on the market. Heading to Google is a great idea, but it might help to search by features rather than generic terms. You can also go to professional and hobbyist forums and ask specific questions. Be careful when searching for information this way, however. It's not always possible to verify the information someone gives out. This can be countered by getting several opinions on the question you're asking. Lastly, when you go to do this research you need to read between the lines. Many companies will pay someone to write a specific kind of review. If the review seems a little too "perfect" in terms of how it reads then it's probably false. An example could be a negative review could be a "customer" telling the story of how their tool chest broke down on them at the worst possible time in the worst possible way. Maybe it happened, but probably not. A good review will stick to the facts. It will tell you the features and nothing more. 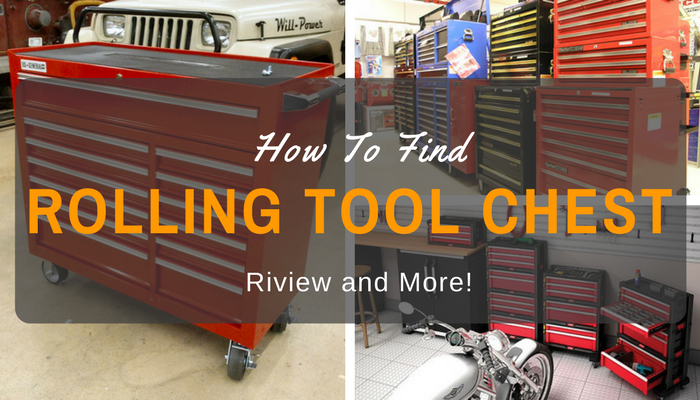 Here are a few reviews to give you an example as well as help you find a great tool chest. Lower priced that most tool boxes of its class. 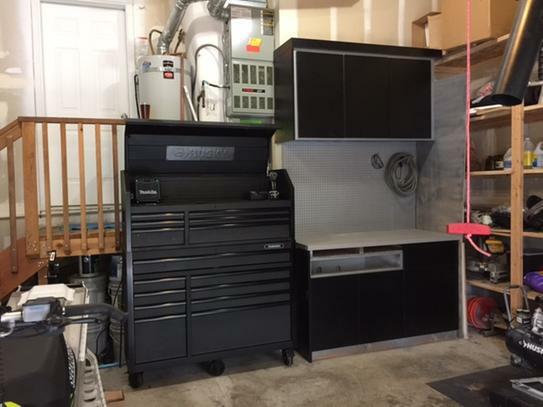 Compact size (roughly the size of the typical mini-refrigerator) can fit into more cramped work spaces, such as private home garages or smaller workshops. Handles lighter and smaller tools, such as those used with home tool kits, hand tools or a large number of art supplies, without any difficulty. Resists chemical damage and light scratches fairly well with a powder coat paint. Weighs in at 41 pounds, one of the lighter tool boxes in its class. Metal is thin in comparison to other tool boxes of its class and tends to dent even from the weight of the tools placed inside of it. Only 22 inches and can not fit very many particularly large tools. Poorly designed locking feature consisting of a single rod that can be pushed up from the bottom, allowing the lower doors to be unlocked. Drawer easily pulled off its tracks. Thin metal means even a brand new model may have dents and rust from being treated roughly during delivery. Wheels are easily damaged by normal use, resulting in getting stuck. They can generally be oiled or repaired, but it's only a matter of time before they need to be replaced. Wide variety of doors for a number of different types of tool, including a typical array of home hand tools, making it particularly useful for do it yourself crafters. Solid locking system that covers each draw and door, keeping people from finding a way to jiggle a drawer loose. Lower price small tool chest. A great model for hobbyists who don't need a professional-grade chest. Fits comfortably in small spaces, even in apartment closets, which makes it a good option for people who work in tight quarters. Liquid proofed black mat on the bottom of the draws to keep stains in check. This also cuts back on light reflection if you're working outdoors. Is not very good for handling heavy duty tools typically associated with major professional crafting work. Even if there was space for them, the metal could easily dent under they're weight. Drawers are not deep enough for particularly thick tools, meaning you might have to leave behind power drills and other tools that are standard to every job. Can not stand a great deal of abuse, meaning that it is best reserved for home use where it will not suffer very much damage. Rolling wheels very stable and maneuverable, allowing the chest to traverse uneven and rough terrain. 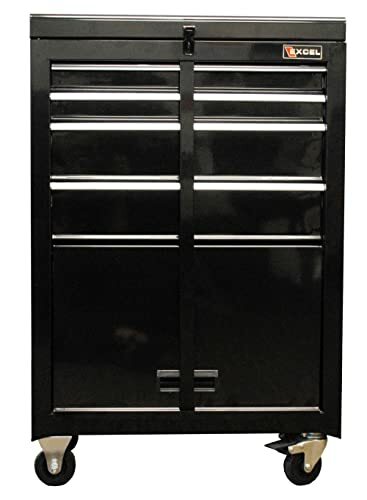 Holds a large number of thinner tools in its multiple drawers and can handle heavier tools without taking any extra damage to its structure. Solid wood top can serve as a stable work space provided the chest can be stabilized in a corner or against a wall. Bumpers around the box allow it to be moved with minimal damaged to the area around it. 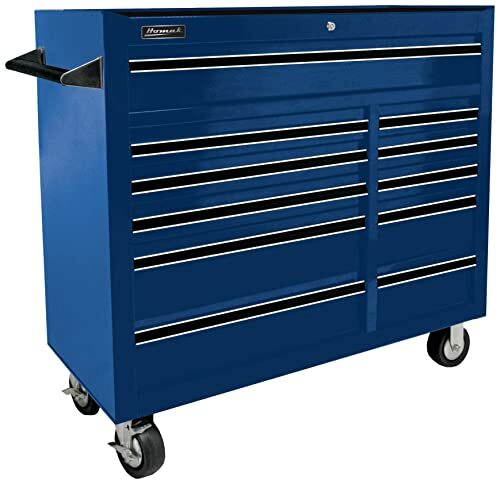 Higher quality and more durable steel than most other tool boxes in its class. Decent quality locking system that can't be manipulated without a key. Higher end small tool box with a higher cost than other models on this list. Somewhat difficult to assemble as the tool chest's durability requires a large number of screws. Key mechanism in the locking system is not entirely reliable and some keys will break out. The key locks are a high enough quality that such events generally require a locksmith. Stainless steel covering is only the face of the tool chest; internal parts of the tool chest are fairly prone to staining and other damage. Though higher quality than most low cost tool boxes, it is still not a professional quality chest. Constructed much more durably and with more features than rolling tool chests of a similar price. Close enough to professional quality that some professional crafters use these boxes as a stop-gap until they can get a new professional grade chest. Sturdy construction and seldom dents unless major force is applied to it, whether intentionally or unintentionally. Can hold larger tools in terms of both size, shape, and weight without difficulty. Assembly is fairly straightforward, and there's no need for specialty tools. Instructions are clear, and it can be finished in a relatively short amount of time. Costly for the hobbyist crafter making it prohibitively expensive for those who are only using it periodically. Drawers only open at a 90 degree angle, which can make placing and removing certain larger tools an awkward chore at best, a difficult problem at worst. Somewhat vulnerable to shipping damages and many of these boxes have come with dents straight out of the box. Low cost tool chest, though the cost may vary if you buy one in-shop rather than buying it over the internet. Lightweight tool chest that's stable enough to be able to roll around without worry of dropping tools. Sturdy wheel construction gives it a lower risk of damage when crossing rough or uneven terrain. Useful for home workshop and do it yourself tool sheds due to it's small shape and size. It can fit in multiple areas, meaning you can get it in and out of your shed without having to take the entire shed apart. Metal parts of the chest are not the strongest metal on the market and dents surprisingly easy. 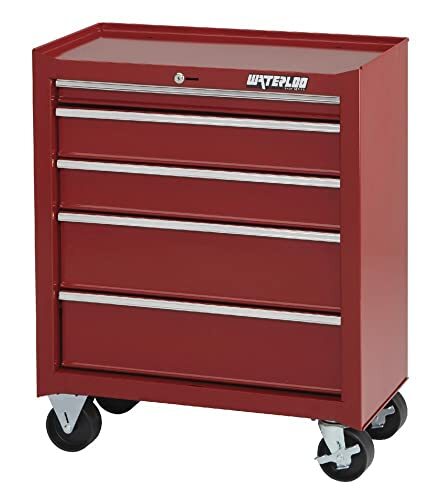 Not a professional quality toolbox by any stretch of the imagination and is too thin to really handle major tools more than 25 points in weight without risking damage. Drawers sometimes have issues with opening. That said, a good synthetic grease on the doors will typically solve the problem of rough drawers slides. Vulnerable to damage from rough handling during shipping, whether one buys from a brick and mortar outlets or an online purchase. 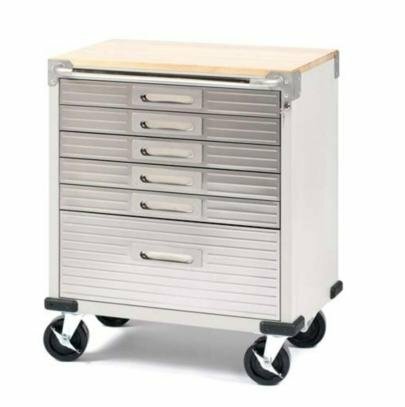 While the "best" rolling tool chest is something of a subjective choice, I would personally choose the Homak BL04011410. It may be costly, but I prefer having a solid tool chest. Then again, my job as landlord brings me all over the place. I may have a harder time maneuvering into places, but I'm much more prepared when I do. If I had to choose a best choice for a smaller tool chest, I'd go with the Best Choice Products Portable Top Chest. The drawers are a bit smaller compared to some of the other options, and the thin drawers would make it less useful over all. However, a number of jobs I get called for can be done with a few wrenches, a screwdriver, and a hammer. That being the case, I may not need the deeper drawers. Either way, both of these tool chests have durable construction for the money. I personally feel that's the most important thing to look for in a tool chest.